Fruits (citrus fruits, apples) and vegetables (green leafy vegetables and tomatoes) make up the glow foods, a review of elementary school science will remind us. These foods contain essential vitamins and minerals for youthful skin, as so dairy products, such as milk and cheese, eggs, and animal protein. There are a lot vitamins and minerals that the skin needs, including the fat soluble vitamins (vitamin A, E, K) vitamins B and C, folic acid, biotin, selenium, and zinc. Even essential fatty acid are also important for a healthy skin. Here are the vitamins and minerals naturally found in food that keep skin looking young and glowing. You'll be amaze that all of this foods are also found in the food pyramid. Vitamin A - maintains and repairs skin tissue and may reduce the risk of psoriasis. Vitamin B complex - vitamin B, boosts cardiovascular health, with better blood flow resulting in healthy, glowing skin. B3 and B5 hydrate the skin. Vitamins C and E -help reduce wrinkles and premature skin aging caused by free radicals. Vitamin K - minimize bruising and may fight wrinkles and protect skin elasticity. Topical preparations with vitamin K are effective in reducing dark circles around the eyes. Folic Acid - a B vitamin, assists healthy cell division and replication and may delaying graying of hair. Biotin - a B vitamin prevents dermatitis and hair loss. Selenium - Reduces the formation of sunburn cells. Copper - together with vitamin C and zinc, helps develop elastin, fibers that support skin structure. Zinc - tames oil production and minimize acne lesions. Perhaps you noticed the variety of foods listed above, All the food groups are represented. 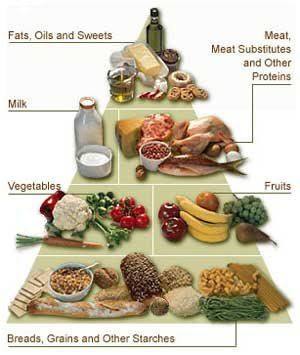 It is important to eat variety of foods, using the food pyramid as a guide for the food groups and portions. Following the food pyramid, will help you include the variety of nutrients your body needs, including the ones for our skin that can help to have a healthy glowing skin for all daily functions . My 100% vote for this food pyramid guide. Sometimes we are pressed with time and tend to forget that these listed food groups containing essential nutrients required by our system are much better and safer than processed supplements. Thanks for the great information. People forget too often that what they eat can effect the quality of their skin and just rely on skin products to help them.